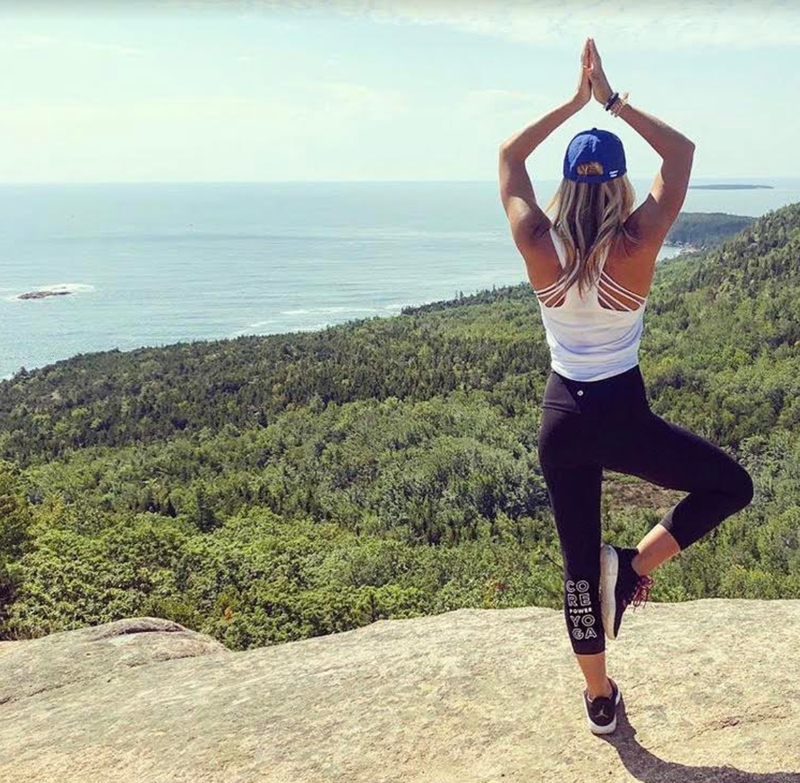 This Maine native quickly became a devout Yoga Sculpt practitioner after experiencing a back injury that sidelined her for a full season of her college diving career. Not only did she regain strength and expedite her rehabilitation through her workouts, but she found it became an essential part of making time for herself amidst the bustle of her busy days. After practicing consistently for a few years, Nicola completed her training with CorePower Yoga this past year and has been teaching in Boston ever since! However, she couldn’t stay away from her home state for too long. Nicola came to Rêve with her mom and aunt and found a space that reflected her personal values as an instructor, and we are so excited that she will be bringing her signature style to Rêve two times each week (6 am Friday and 8 am Saturday)! This week, she shared with us what inspired her to pursue her teaching certification, what marks her favorite part of class, and what we can come to expect when we walk into the Yoga room with her (hint: her amazing playlists will make it difficult to stay still during extended holds). 1. How did you find out about/start coming to Rêve? I’ve been living in Boston, but pretty much everyone I know in the Portland area works out at Rêve! My mother and Aunt Toni introduced me originally and what attracted me to the studio was the amazing things I heard about the music, instructors, and culture at Rêve! How did you start teaching yoga? My junior year of college I suffered a severe back injury that made me sit out for an entire diving season. Determined to recover quickly, I committed to my rehab which ultimately led me to a workout regimen that incorporated a lot of core, glute, balance, and work. I fell in love with the first ever Yoga Sculpt class I took. I began to practice daily and realized that in that warm room, for those 60 minutes, I felt happier and more at peace than ever. It was the only time throughout the day that i could truly take time for myself. I loved the way my instructors made me feel and the connections I built within the community. In the beginning of 2018, I made the decision to bite the bullet and go through a rigorous training program at CorePower Yoga! I found out I got the job on my Nana's birthday and have never turned back since! What should the Rêve community expect from your classes? How is it different than a "normal" yoga class? Rêvers can expect a positive, happy, and energetic class! Yoga can be intimidating to some people, but this class is for students at all levels - I offer many modifications and challenging versions of each exercise so that people of all ages/experience levels can come and have fun! I want everyone to feel CONFIDENT after taking my class, believe in themselves, and understand the importance of taking 60 minutes for them and only THEM! There are two specific things that make each class for me. First, carving out a space at the beginning of class for a unique introduction and to allow everyone to set an intention. This allows them a chance to connect with themselves and one another, but it is also where I make connections with my students. I share something personal going in my life, connecting that to class through an intention. An intention can be a word, quote, or somebody whom a student may want to dedicate their practice. I link my personal experiences with the intention for class and what muscle group/theme we are working in that particular sequence. Having students come up to me at the end of class and say, "Your intention really resonated with me because I'm going through something similar..." that's when I know I made a true connection with my students and hopefully helped brighten their day even just a little bit. Second, I love seeing students sing or dance to my music! Playlists take a long time to put together and, to me, music is what drives the entire class! So, to see students enjoying something I worked so hard to put together makes me pumped up!